Drones are multirotor, remote-control (RC) flying devices that offer a new way of looking at the world around you from never-before-imagined perspectives, and sharing those adventures through photos and video. Many RC drones offer live first-person viewing (FPV), putting you in the driver's seat on an exhilarating joyride where you can explore and even race from a pilot's point of view. If you've ever dreamed of competing in an air race or performing tricks and stunts with your fellow fliers in an air show, becoming a drone pilot might be the closest you'll come to experiencing that thrill firsthand. Drones range in price from less than $25 to several thousand dollars, and the best drone for you isn't necessarily the most expensive one. The best drone for you depends on your experience level and how you plan to use it. Most toy drones are small, light, and designed to fly safely indoors. Their size and basic technology make them difficult to control outside, especially when there's wind. Camera-included models will capture lower-quality images and video than more expensive photography drones. Toy drones are a great way to get your feet wet in the hobby and learn the basics of flying without breaking the bank. Photography drones are usually bigger, heavier, and more expensive than toy drones. 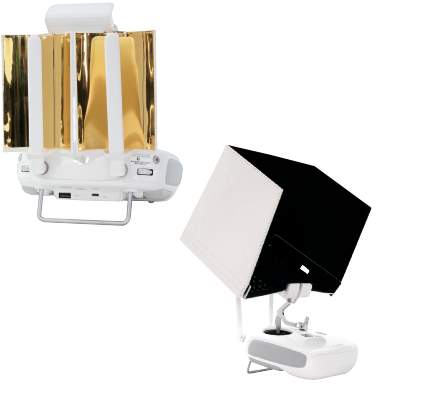 They are designed for outdoor flight and aerial photography — great for flying around a park, taking selfies, and getting a bird's-eye view of your surroundings. When shopping for a photography drone, you'll want to look into the camera quality, including the megapixels and video resolution. It's also important to note whether a photography drone has a gimbal or a fixed camera. Other features to look for that make flying easier include automated flight modes and obstacle avoidance. 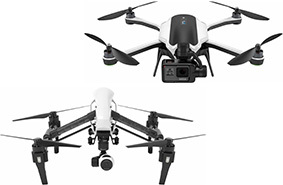 Many photography drones for hobbyists, like the DJI Phantom 4 and Mavic Pro, support 4K video, and include obstacle avoidance and image stabilization. The collapsible Yuneec Breeze is a smaller, more affordable option for someone looking to buy their first photography drone. Racing drones are small quadcopters that are designed for forward flight and are meant to compete in FPV (first-person view) racing and other drone events. 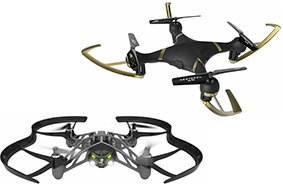 These drones are specifically designed for speed, agility and durability. Their parts are interchangeable and can affect the acceleration, speed and control of the drone. High-performance controllers adjust the amount of power that goes to motors, allowing them to speed up or slow down quickly. These drones have fixed cameras that are used to assist the pilot in maneuvering the drone. FPV video from the camera can be streamed to a display on the pilot's mobile device or controller, or to FPV goggles. What Are the Best Drone Accessories and Add-Ons? Drones with sufficient lift from their motors and propellers can be equipped with additional hardware. Check the manufacturer's website for the lift capacity of your drone. Drones designed to support an external camera are typically able to carry a half pound or more of additional weight beyond that of the drone itself. Extra weight will increase the demand placed on the drone's motors and may reduce flight time and affect your in-air stability. Whether you're heading out on a flying adventure or storing your drone in the closet till your next session, don't just shove your expensive equipment in an old duffel bag. 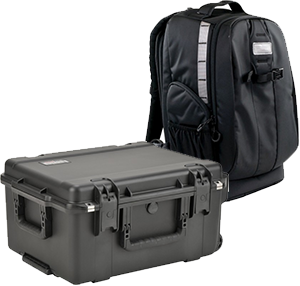 Protect your investment with a quality backpack or case designed specifically to hold your drone. Your case should have a padded, foam interior with cutouts to snugly fit your drone and accessories, safeguarding them from drops and bouncing around in transit. If you plan to hike long distances with your case, choose one with dual padded straps to keep you comfortable on your journey. A drone battery offers 5–25 minutes of flight time on a single charge, and can take an hour or more to recharge. But oftentimes the battery can be easily removed and replaced with a fresh one once its charge is spent. 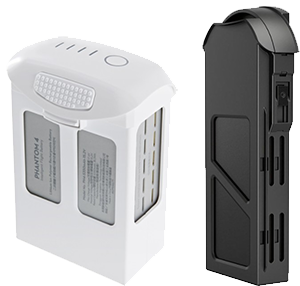 To spend more time in the air each session, you should purchase one or more extra rechargeable batteries that are compatible with your drone. The remote controller sends your commands to the drone's flight controller, which, depending on its level of sophistication, can gauge a variety of external factors such as wind speed and barometric pressure to turn your commands into motion. Controller configurations range from just two joysticks that control thrust and turning, to complex layouts controlling every aspect of the drone and camera simultaneously. Most drones can be synchronized with aftermarket remote controllers (known as tethering), so you can continue using the controller you're comfortable with after you purchase a new drone. Alternatively, some drones don't need a standalone remote controller to function. These drones create their own Wi-Fi hotspot, to which you can connect your smartphone or tablet and pilot the drone using a downloadable app. A sunshade can be attached to your controller to protect your mobile device from direct sunlight so you always have a clear view of your screen. Use the thumb sticks of your radio transmitter to manually control your drone's flight. The left stick controls lift and rotates the drone to point in a different forward direction, while the right stick controls horizontal movement — forward, backward and side-to-side. Unlike RC helicopters, most drones are built to hover, meaning you don't need to constantly keep a thumb on the lift stick for the drone to remain in a static position above the ground. This allows you to use additional flight and camera control buttons more easily. If your drone is equipped with GPS, you can lock it into both horizontal and vertical positions, regardless of wind conditions. Depending on your drone and transmitter, your control range can be anywhere from a few hundred feet to a mile or more away. External factors like signal interference from radio towers and weather can affect the controllable distance, as well. If you're looking to expand your drone's flight capabilities, you can attach a range booster to your controller. The bad news: No one who flies drones lands perfectly every time. Whether it's a collision with a tree or a hard landing on the pavement, the occasional mishap is an inevitable part of flying. The good news: There's no reason to let a fear of crashing detract from the fun of flying, because drones are made to withstand crashes. Their exteriors are lightweight, made out of strong materials like carbon fiber and polypropylene foam, and designed to protect the most sensitive components — the motors, transmitters and CPUs. And the parts that are most easily broken, the propellers, are also the cheapest to replace and easiest to repair. Drones often come with spare propellers, and you can purchase additional spares separately, too. Keep in mind that half of a drone's propellers spin clockwise and half counterclockwise to enhance stability, so you want a couple spare propellers of each kind. Other drone parts that may come in handy for your flights include landing gear, propeller guards and LED bands. 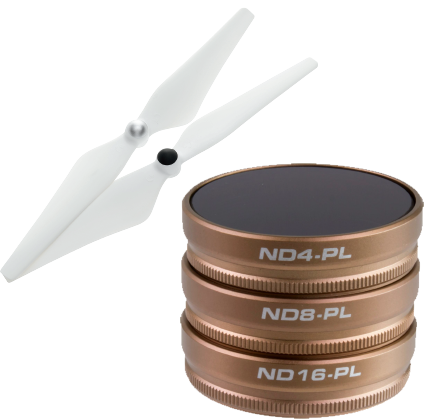 If you use your drone for photography, lens filters can be used for improving color and saturation, reducing unwanted reflections and more. Resist the urge to pull your drone out of the box and immediately start flying. In addition to a remote controller, most drones have an app you can download to control it via a smartphone or tablet. Before takeoff, update all software and firmware, and read the instructions thoroughly. How do I connect my drone to my smartphone or tablet? Once you've downloaded the necessary app on your device, you can connect to the drone via Bluetooth or a Wi-Fi connection. The app also lets you save the video and photos from your flight on your device storage or to a cloud storage system. What are some advanced drone flying controls? Your drone may have open-source capabilities so you or other third-party developers and tinkerers can create software to perform a variety of different tasks. For instance, you can download apps that let you use Google Earth to create waypoints on a flight path and camera focus points for the drone to execute. There is also image/video editing and sharing software, automatic following of radio-tagged objects, and much more. How does first-person view (FPV) mode work? Depending on the model, the signals being sent from your drone may include a real-time video feed courtesy of the drone's camera. With this video, you can use your smartphone or tablet as both a viewing screen and controller; if you're using a remote controller, it may have an HDMI port that can connect to a compatible screen while keeping the primary control functions with the remote. On your screen, a video game–style display overlays your flight video. This display contains telemetry data such as altitude and battery life, and perhaps even a mini map showing an overhead view of your drone's position via GPS. If you're connected to a touch screen, there may also be quick control functions like video and photo capture, as well as preset tricks and automatic commands including takeoff, hover and return home that make flying easier and safer. How do I prevent my drone from crashing? To make flying easier, there are a number of safety settings available on most drones, including auto land and auto return functions to ensure your drone doesn't drop out of the sky when it's getting low on battery power. Other functions include no-fly zones and flight ceilings to help you make sure you don't accidentally take your drone out of controllable range or into a restricted area. The telemetry data your drone transmits might include altitude and distance from home to help you stay in safe areas. Some drone apps allow you to attend a virtual drone flight school where you can get the hang of flying a virtual drone before testing your skills in the real world. Where Can I Learn More About Flying Drones Responsibly? A great resource to learn about flying drones is the Academy of Model Aeronautics (AMA). The AMA can also help you find drone enthusiasts and remote-control flying clubs in your area. Connecting with others who are interested in drones is an excellent way to find out where to fly and learn proper flying techniques and advanced tips and tricks. These clubs meet regularly to talk about, fly and even race drones. Before takeoff, update all software and firmware, and read the instructions thoroughly. See the FAA website for requirements and information about flying a drone safely. Additional state or local requirements may apply. Check your local jurisdiction. The following websites may help you make informed decisions about flying your drone: www.knowbeforeyoufly.org and www.modelaircraft.org.